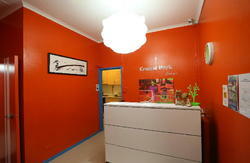 Clean, friendly accommodation at affordable prices! We have quality bed linens, blanket & pillows, a newly renovated kitchen, and a clean relaxing lounge area to unwind. Extensively renovated with all rooms featuring televisions, bar fridges, air conditioning, and tea & coffee making facilities. Most guestrooms have private ensuite bathrooms. We are perfectly located for exploring Sydney with public transport right at door step! We are only a 20 minute drive from Sydney's International and Domestic Airports. Internet is available, best prices are guaranteed!